Ontus Vanin is an Imperial battlemage who is retired from the Mages Guild. He "sleeps late and reads trashy books". After spending 40 years at the Arcane University, he claims to be completely useless and proud of it. He is still officially considered to be a researcher at the university; because of that connection, Hrormir's Icestaff is returned to Ontus' house during the Thieves Guild quest Misdirection. 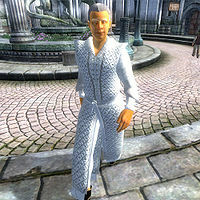 He lives in the Imperial City's Talos Plaza District. True to his word, Ontus sleeps late and does not roll out of bed until 10am. He will begin his day by leaving the private quarters of his home to head down to the main area of his house where he will wander around for the next two hours. On weekdays, he will leave his house at noon to travel to The Tiber Septim Hotel. He will find a seat inside the inn and will then enjoy a two-hour lunch. At 2pm, he may leave The Tiber Septim Hotel to head to the Market District. Specifically, he will travel to either Rindir's Staffs, Mystic Emporium, The Gilded Carafe, The Main Ingredient, or First Edition at random. Once he arrives at one of these locations, he may leave the store immediately and will proceed to travel to one of the other stores. Instead of traveling to one of the five stores, Ontus may instead wander around at whatever location he is currently in. However, at any time between 2pm and 8pm, he may stop wandering around to travel to one of these five stores. After Ontus has finished his shopping around the Market District, on weekdays he will head to The Foaming Flask at 8pm. He will enjoy a four-hour meal here before he returns to his house at midnight. Enjoying the lack of responsibilities that goes along with his retirement, Ontus will wander around his home for two more hours until he finally heads up to his private quarters at 2am to go to sleep. On weekends, Ontus' schedule is a little bit simpler. He will still wake up at 10am but will wander around his house until 2pm, skipping his lunch at The Tiber Septim Hotel. At 2pm he will begin his process of traveling to the stores in the Market District or will simply wander around at his current location until he sets out to travel to one of these stores. At 8pm, he will leave the Market District to head back to his home, skipping his trip to The Foaming Flask. He will proceed to wander around the main area of his house until his bedtime at 2am. The only exception to this schedule is during Light the Dragonfires, when all Imperial City residents are confined to their homes by martial law. Ontus wears a pair of gold trimmed shoes and a white mage's robe. He carries around a random staff and a steel longsword for protection. He also has the key to his house and some gold. Ontus knows a leveled set of battlemage spells. Ontus seems to be enjoying his retirement and will greet you with, "Ontus Vanin, retired. Sleep late, and read trashy books. I don't keep up with Mages Guild affairs any more." When asked about the Imperial City, he will tell you about his career at the Arcane University: "I spent 40 years at the Arcane University. Good years, but I don't miss it. Now I'm completely useless, and proud of it." You can also ask him about the topic of "Daedric Shrines", at which point he will give you directions to three shrines in the area: "I can think of three. The Hircine shrine is south of town, northeast of Bravil, between the Upper Niben and the Green Road. The Mephala shrine is northeast of the junction of the Red Ring Road and the Silver Road. I've heard there's a Vaermina shrine at the headwaters of the Reed River, though I've never been there myself." This will cause map markers for the three mentioned shrines to be added to your map. Because he is no longer a member of the Mages Guild, Mages Guild members can murder him without expulsion. Once you have read Modern Heretics or spoken with Ulene Hlervu about "Cheydinhal", a new "Daedra shrines" conversation topic will appear. When you speak to Ontus about this, he will mark Hircine's Shrine, Mephala's Shrine, and Vaermina's Shrine on your map. Ontus actually dislikes Mages Guild members: he has a -5 disposition modifier towards Mages Guild members. Since this modifier is multiplied by your Mages Guild rank, when you become Arch-Mage, Ontus will have a -50 disposition adjustment to you. This is generally enough to make him attack you on sight, especially as he has slightly higher aggression than most NPCs. This can lead to the guards and townspeople coming to your assistance, then fighting and killing each other as a result of accidental hits. To prevent him from attacking you when you advance through the Mages Guild, the easiest strategy is to be sure to talk to Ontus early in the game and use the Speechcraft minigame to boost his disposition as high as possible. If you missed the chance to raise his disposition early in the game, a combination of Calm and Charm spells can stop him attacking, then you can raise his disposition in the Speechcraft minigame. After the Fighter's Stronghold official plug-in is installed, Ontus suffers from the Mystic Emporium Bug and will often be found standing just outside the store, unable to enter. Esta página foi modificada pela última vez à(s) 05h38min de 20 de outubro de 2015.